The collapse occured in the mountainous region of Chirajara in central Colombia. The 446-meter-long bridge was set to be opened in March as part of a major highway linked to the capital Bogota. At least 10 construction workers died and several were injured after a partially constructed bridge in central Colombia collapsed on Monday. The laborers were working on the bridge's drainage system when the incident occurred. The victims fell 280 meters (920 feet) into a ravine in Chirajara about 95 kilometers (60 miles) from the Colombian capital of Bogota. Nine of the workers were killed immediately and a tenth worker died of his injuries in a nearby hospital. Several laborers were injured and 11 are reportedly missing. The agency in charge of the project, Coviandes, said that the injured have been taken to a hospital in Villavicencio, the capital of the department of Meta. Authorities said they are investigating the cause of the collapse and trying to find out how many people were on the structure. The 446-meter-long bridge was set to be inaugurated in March as part of a highway connecting Bogota to the city of Villavicencio. The bridge and road overhaul are a part of the country’s massive “4G” infrastructure program that is attracting billions of dollars in private-public partnership investments to improve Colombia’s transportation system with eight bridges and five tunnels. At least ten construction workers were killed and five injured when a partially-constructed bridge collapsed in central Colombia. 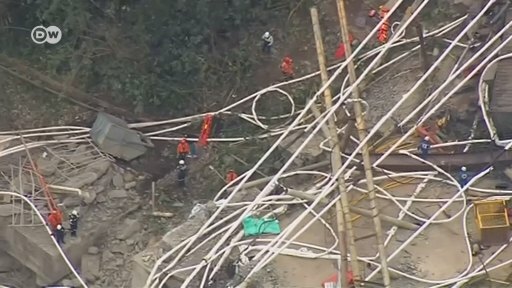 Civil Defense authorities say the laborers were working on drainage along the bridge when the structure fell Monday about 95 kilometers from Bogota. The bodies of a family of three, an Italian-Jamaican couple and their daughter, were found in their badly crushed car. The Morandi Bridge collapsed on Tuesday, killing 43 people. Bridges and buildings can be architectural marvels, but also lead to deadly disasters. These dilapidated or botched constructions turned out to be fatal.